CHICAGO – A television premiere is not unlike the first term of an elected candidate in that advertisements give way to actuality and constituents are forced to decide whether or not they want the candidate to be a part of their lives a second time. The premiere of Starz’s highly-anticipated and Chicago-set “Boss” with Kelsey Grammer is a shaky first term, a tonally inconsistent affair that nonetheless displays enough ambition that one could easily vote for it to return in the hope that it develops into the TV leader it could ultimately end up being. With tones of Shakespearian tragedy mixed with the realism of Windy City politics (and the blend doesn’t always completely take, leading to some of the tonal inconsistencies of the first episode, which I’ll get to later), “Boss” is an incredibly self-important program that was made by people who think they’re doing something remarkable in their unveiling of corruption in places of power. While the attempt at something that sometimes feels inspired by ’70s era filmmaking is notable, especially for a network known more for decapitations and bare breasts, the idea that viewers are still naive enough to be shocked that the Emperor has no clothes leaves “Boss” a bit ineffective. We’ve seen stories like this before. And usually on the nightly news. 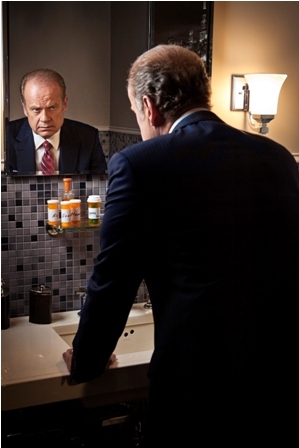 Kelsey Grammer moves from comedy to drama as Mayor Tom Kane, the key to the power structure of the city of Chicago. The show opens with Kane being given a dire diagnosis. He’s losing his mind. It will be gradual, but dementia will set in over the next few years and he won’t be able to function, much less lead. Now, of course, Kane is not the kind of guy who will easily step down and so much of “Boss” will be about a powerful man with a growing Achille’s Heel and not only how he struggles to lead through his diminishing capabilities but how he keeps his flaw secret from his enemies. One of the most interesting things about “Boss” is that Mayor Kane seems to be well-liked. The premiere, directed by the great Gus Van Sant (“Milk,” “Good Will Hunting”), features a man not only in control because he took it but because people gave it to him. At a rally for the Governor’s race (the question of who the Mayor will put his weight behind, and, consequently, use as a puppet, is a major focus of the first arc of the series), people cheer and clearly like their city’s leader. The fact that Mayor Kane is strong and smart makes him powerful but the fact that he’s well-liked by his constituency makes him dangerous. Of course, every Macbeth need a Lady and Mayor Kane’s wife Meredith (Connie Nielsen of “Gladiator”) seems like she could easily be the most interesting character on the series. Not only is Nielsen a great, underrated actress but she has a juicy role as Carmela Soprano to Grammer’s Tony. There seems to be even less love here than in the tumultuous Soprano union as the Kane marriage appears almost purely for the cameras and the importance of giving the impression of a happy family to a voting public. The supporting cast includes apparently regular characters like aide Kitty O’Neill (Kathleen Robertson), Chief of Staff Ezra Stone (Martin Donovan), Kane’s estranged daughter (Hannah Ware), and State Treasurer Ben Zajac (Jeff Hephner) but it’s also the kind of drama in which the ensemble will clearly fluctuate as the show attempts to deconstruct the power structure of the best city in the world. Deconstruction requires a lot of dialogue and “Boss” is a talky show. Be prepared for discussion of garbage strikes and political machinations. This is the kind of piece that doesn’t give the viewer much time for catch-up and while I admire any program that treats their audience with intellectual respect, “Boss” is a bit too dialogue-heavy. To be blunt, it gets a little dull. The occasionally boring tone isn’t helped by the fact that it feels like everyone on “Boss” thought they were making the most important new show of the year. There’s a self-important, pretentious air to “Boss” that really hurts the program. You can be Shakespearian but don’t advertise that you think you’re Shakespearian. And, as much as I love a lot of Van Sant’s film work, I think that self-important tone can probably be traced back to the director who took this project as seriously as film, forgetting that a series premiere has much different goals. We can handle pretension for two hours in a dark theater much more than on a show with characters that we’re supposed to spend time with every Friday night. Why not give up on “Boss” immediately? The cast is strong, especially Grammer and Nielsen, and this is still an intriguing idea for a weekly drama. Something must have clicked for Starz executives as the network has already ordered a second season. Perhaps it just takes some time to click for viewers. The writers and producers of “Boss” need to get some dirt under their character’s nails. They need to realize that no one climbs the ladder of politics without a little grime. And they need to make these characters feel more like people and less like mouthpieces. The talent is here for that to happen. The premiere is a disappointment but “Boss” still has the potential to be an effective TV leader. If not, viewers will vote simply by tuning out. 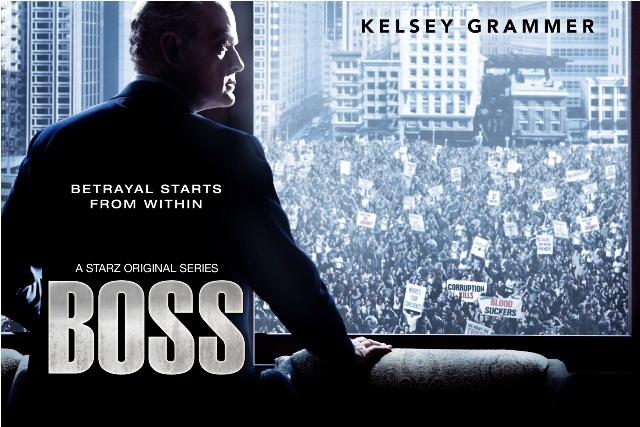 “Boss” stars Kelsey Grammer, Connie Nielsen, Kathleen Robertson, Martin Donovan, Hannah Ware, and Jeff Hephner. The premiere was directed by Gus Van Sant. It airs on Starz on October 21st, 2011 at 9pm CST.